I was going to look at the flag of Hesse this week, but decided it was kind of boring (there are multiple red over white horizontal bicolors out there. Even if it's defaced with the Coat of Arms, it's still kind of 'meh') so switched it up to take a look at the flag of Saarland instead! Right off the bat this proved to be an interesting choice, because outside of the city-states of Berlin, Bremen and Hamburg, Saarland is Germany's smallest state in both population and area. Historically, it's also something of an interesting anomaly, because prior to the aftermath of World War I, when it came into being as 'The Territory of the Saar Basin' it hadn't existed as an entity at all. Parts of it had been Bavarian, parts Prussian- but there had been no Saar before The League of Nations upped and created it. The inhabitants voted (90.8% of them) to rejoined Germany in 1935, but post-World War II from 1947 until 1956, it was a French occupied territory distinct and separate from the rest of Germany. Between 1950 and 1956 it was a member of the Council of Europe and was actually offered independence in a 1955 referendum, but voters decided to rejoin West Germany instead and even then, they kept using their own currency for another three years. (The Saar franc). Before adopting it's current flag in 1957: the Post-World War II flag has obvious connections to the flag of France, which had control over the place at the time. 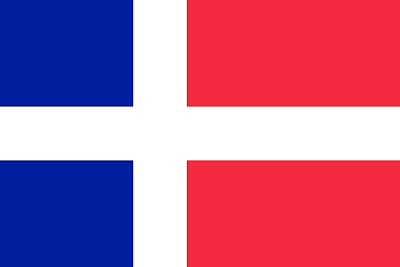 It's essentially the colors of the French flag split by a Scandanavian cross. The League of Nations era flag (1919-1935) is also interesting, because it bears a close resemblance to the current flag of Estonia- though the order of the colors is different and the Estonian shade of blue is decidedly lighter. 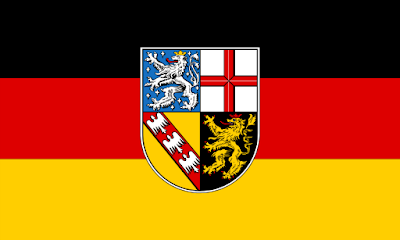 The current flag (seen above) is based on the flag of Germany, but defaced by the Coat of Arms of the Saarland- which, despite my lack of knowledge about heraldry (something I may want to remedy at some point) is actually pretty simple to break down. The first quarter of the shield (upper left) is the arms of Prince of Nassau-Saarbrucken, the second quarter (upper right) are the arts of the prince-elector and Archbishop of Trier, the third quarter (lower left) are the arms of the duchy of Lorraine and the final quarter (lower right) are the arms of the prince elector Palatinate. Together, they represent the four historical entities that had a chunk of Saarland back in the day. And that's the unusual vexillological history of Germany's smallest state!